Da, Da, Daaaaaaa, Da, Daa! Da, da, da, daa, daa, da, da, da, da, Daaaaaaaaaaa, Dadadadaaaaaa! You see, I dooooooo, do, doo! Do, do, do, do, doo, doo, do, do, do, Dooooooooooo, Do, do, do, doooooo! I am the Green Panther! I am the Green Panther, and I doooo, I do, I do, I do, I doo, I doo, I dooooooo, I dooooo, do, do, do, dooo! Wow, wow, wow, wooooooow, wowowowooooooooooooooooooooooooooooooooow! And when I turned not Blue! And when I turned not Red! I was different than the rest of the FEDS! And when I was not Blue! I was not like you! Is a Green Panther instead! And the things you knew! Only came from the televisions who you knew! For once I turn you Green inside! You will never believe the televisions’ news! You will learn things that are new! You will not turn yourself Blue! And change the way we live our lives! Green Panther is the New News in Life! So what do you do when you are Blue? Do you want to be Pink inside of you? And let the FEDS do what they want to do to you? Or be Green deep inside, and try to fight your way in life? Not the Black Ones who are around! When I stand out in their Crowd! Because I think a different way! Who is afraid to really fight! That the Blues will have throughout their lives! Now I am ready to fight! It does not matter what color you are inside! If we are willing to die! We can all win this fight! If we all join in on this fight! Nor am I a White Panther that few have seen in life! No Human has seen in life! It will be showed throughout the World! Who wants to live on a New World! Like we are Pack of Wolves! Who are killing in their Antichrist Fascism Wars! It will be for only one cause! Will not kill children at all! Trying to Execute the Illuminati in their wars! And was Locked Up inside of their doors! Who wanted their wars to win! But let them assonate the Green Panther! Let my Blood spill all over the World! Who will change the way we all feel! They thought they would surely win! Let us all join in on this War! Also pull out their Swords! We will all win this War! And stop all of their World wars! Wow, wow, wow, wooooooow, wowowowooooooooooooooooooooooooooooooooow!!!! 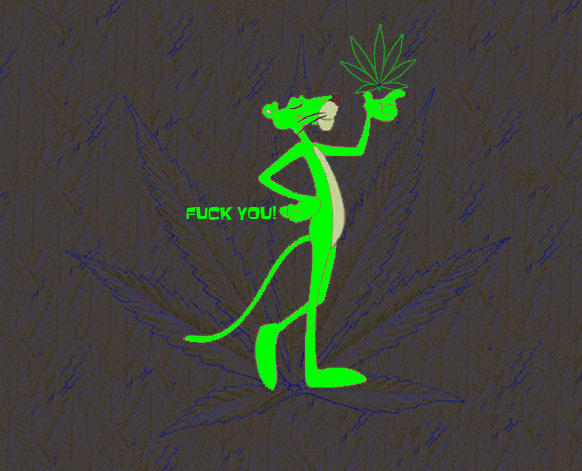 THE GREEN PANTHER POEM HAS NO COPYRIGHTS, AND IS HEMP FREE FOR PUBLIC DOMAIN USE. BUT, IF YOU USE THIS POEM, FOR SONG LYRICS, ECT., PLEASE WRITE, "WRITTEN BY; THE ONE WHO CARES, ABOUT YOU...."